Turning Point for God was founded in 1982 as the broadcast ministry of Dr. David Jeremiah to deliver the unchanging Word of God to an ever-changing world. Over the years, the phenomenal growth of the English broadcast ministry has enabled David Jeremiah’s teaching to be translated into multiple languages, taking the ministry outreach beyond our borders. Today, Turning Point reaches every state in the U.S., covers six continents, and touches people around the globe with the saving knowledge of Jesus Christ. Stay connected with Turning Point through email updates! Turning Point is a 501(c)3 nonprofit organization wholly supported by friends of the ministry and not underwritten by any church or organization. Turning Point is grateful for the generosity of two groups who work to ensure its financial stability: Bible Strong Partners and The Jeremiah Legacy Society. Bible Strong Partners make a monthly commitment of support while members of The Jeremiah Legacy Society include Turning Point in their planned giving. These extraordinary individuals make it possible for Dr. Jeremiah to teach the whole counsel of God’s Word, not bending to political, financial, or topical trends. Regardless of the level or frequency of giving, Turning Point is grateful for each ministry partner as they promote Bible Strong teaching through their generous giving. David Jeremiah’s commitment to Bible Strong teaching with an emphasis on content—not causes, current events, or politics—is Turning Point’s trademark. Creative vignettes, special musical selections, and seasonal productions supplement his messages, but the purpose of every program is to draw men and women into knowledge of God’s Word. Study materials designed to engage participants in the Word of God accompany each broadcast. These innovative resources combined with the unchanging Truth of God’s Word continue to fuel the growth of Turning Point’s broadcast ministries. Turning Point Radio reaches a potential worldwide audience of 480 million people through nearly 2 million annual broadcasts. Turning Point Radio is one of the largest syndicated Christian radio broadcasts in the United States. Find a station near you or stream through Turning Point’s website or app. 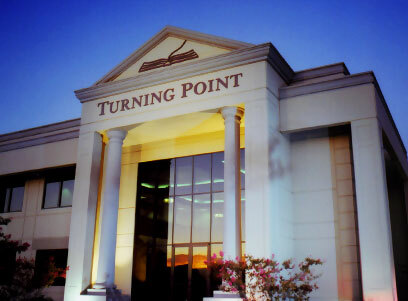 Turning Point Television is available around the globe. Finda a station near you or stream through the website or app. Turning Point Television has the potential to reach more than 2 billion households worldwide each week. Turning Points Magazine and Devotional is one of the best ways to learn about special events and upcoming sermon series. With inspirational articles and instructive daily devotionals, it provides something unique, fresh, and timely on a monthly basis. Request your complimentary subscription today. Drawing on more than forty years of study, The Jeremiah Study Bible helps readers understand what the Bible says, what it means, and what it means specifically for them. With insightful and practical content, The Jeremiah Study Bible represents David Jeremiah’s most comprehensive resource to date. Turning Points Magazine and Devotional is delivered to more than 300,000 homes every month. David Jeremiah has authored more than eighty books, including the Airship Genesis Kids Study Bible, numerous study guides, and a variety of other resources. Please visit our online store to shop for study materials. DavidJeremiah.org is Turning Point’s online hub. It features a daily e-devotional, current broadcast schedules, and streaming opportunities. Every month, relevant articles and ministry updates, including details for upcoming live events, are posted. The website’s online store offers Turning Point’s complete selection of Bibles, books, and other resources. Be among the first to know about ministry news through Turning Point’s email updates. Turning Point’s mobile app provides on-demand access to archived broadcast messages, articles, and study materials. Available on a variety of platforms and in several languages, the mobile app keeps you connected with Turning Point wherever you may be. David Jeremiah offers additional study resources through topical websites related to his message series and books. They feature short videos and articles to help visitors engage with the messages and apply them in meaningful ways. More than 1 million downloads! Going Global describes the international reach of Turning Point's ministry. Route 66 provides road stops of encouragement through the 66 books of the Bible with 60-second audio messages by Dr. Jeremiah. David Jeremiah is the pastor of Shadow Mountain Community Church, which is located in San Diego, California. Please consider visiting if you are ever in the area. Another extension of David Jeremiah’s online ministry can be found at DavidJeremiah.blog. Covering a variety of subjects, the blog offers a topical and searchable database of articles. Follow Turning Point on your favorite social networking platform—Facebook, Twitter or Instagram. Visit Turning Point’s YouTube page to view a selection of David Jeremiah’s messages. Broadcast and digital media are powerful and effective tools for sharing God’s Word, but they lack personal connection. Because of this, David Jeremiah regularly tours the U.S., and occasionally travels abroad, to deliver Bible Strong teaching through live events. Turning Point also offers cruises and tours for those seeking to grow spiritually while exploring God’s creation. More than 23,000 attendees participated in the Overcomer Tour in 2018, resulting in 127 decisions for Christ! Many of Turning Point’s ministry partners have shared prayer requests for the salvation of their children and grandchildren. As a result, God laid it on David Jeremiah’s heart to reach children with the Good News in an engaging and exciting way. In 2016, Airship Genesis blasted off with a special children's Study Bible, filled with truths from Scripture and real-life applications for children in today’s world. Families can join the online audio adventures of the Genesis Exploration Squad on the Kids Page here. Many more Bible Strong Airship Genesis resources are now available. Visit Airship Genesis online for a complete selection and join our email club for exclusive updates. Believing that God has called this ministry to "be witnesses . . . to the end of the earth" (Acts 1:8), Turning Point prayerfully translates and transmits its programming into every language possible. Visit our Going Global page to discover what God is doing around the world through Turning Point. David Jeremiah’s messages are broadcasted in 10 languages—and counting! David Jeremiah believes our dreams should always be greater than our memories. So, at Turning Point, we seize every opportunity God puts in our path, which allows us to continue growing and to continue reaching new hearts with God’s Word. We’re so glad you are on this journey with us. With your support, we will continue delivering the unchanging Word of God to an ever-changing world. The church faith is expressed in that form of doctrine generally held by those known as Baptists, the distinguishing features of which are stated below. As Baptists, we stand for the supreme authority of the Word of God as the only rule of faith and practice, as opposed to all human traditions. We stand for the ordinances of Baptism and the Lord’s Supper as Christ enjoined them upon His followers; the same in number, in act, in order and in symbolic meaning, unchanged and unchangeable ‘til He comes again. As a New Testament Church, we affirm our belief in the individual priesthood of the believer, in the verbal inspiration and authority of the Scriptures; in the Virgin Birth and essential Deity of our Lord; in His atoning death and bodily resurrection; in His ascension into Heaven and promised endowment of the Holy Spirit; in His personal, visible premillennial return and ultimate and undisputed Kingdom and reign. We stand for a regenerated and spiritual church, holding that only those who have confessed a personal faith in Jesus Christ as Savior and Lord shall be received into this church or welcomed to its ordinances. That a Christian Church is a local congregation, under Christ complete in itself, sovereign and independent. That Christ committed to each church the sole guardianship and control of the ordinances; i.e., preaching the Gospel, baptizing and administering the Lord’s Supper. That all church rights and privileges are limited to the discipline of each local church. That no semblance of ecclesiastical authority can be exercised except by a local church. The local church alone can elect, commission, and depose its officers, receive discipline and exclude its members.